Hello there! 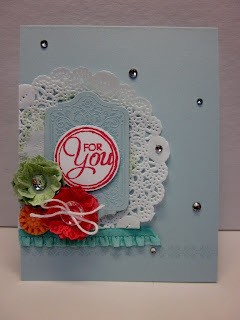 Today's post is my goddess card for The Stampin' Royalty. 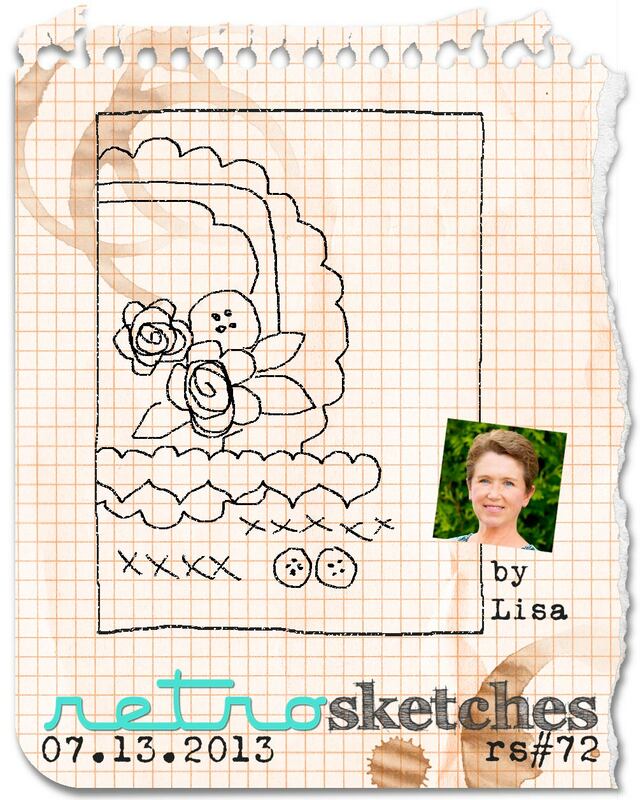 This week's challenge is a photo inspiration challenge, so take a look at this fabulous sketch, create something beautiful, and head on over to the Stampin' Royalty to link it up. Flowers please! 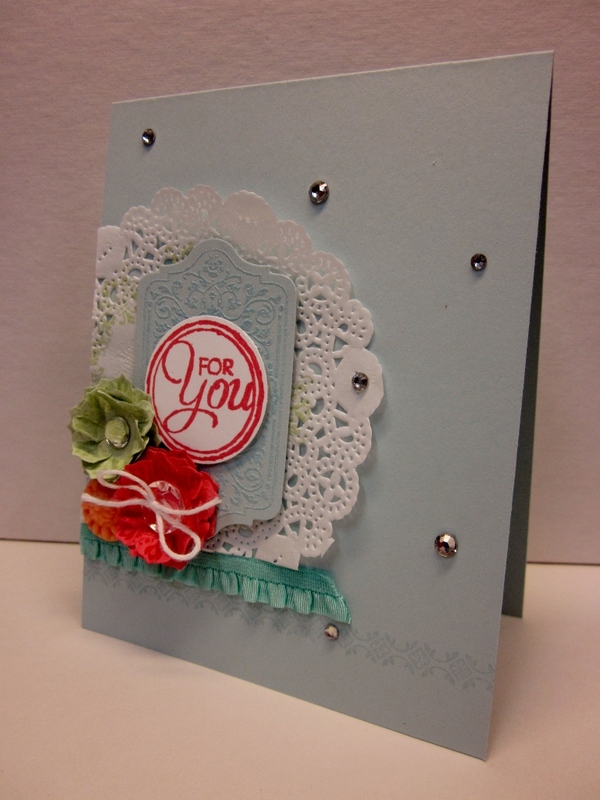 This photo inspiration just begs for flowers, so here are two sweet flowers stamped and die cut with the Daydream Medallion stamp set and framelit combo. A bit of crumpling, snipping, and layering is simple to do but packs a big punch. 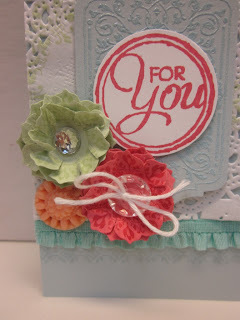 One of the new In Color boutique details buttons finishes my trio. 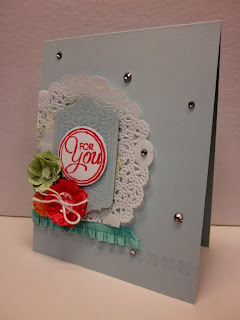 Embossing is so fun and makes a great impact. 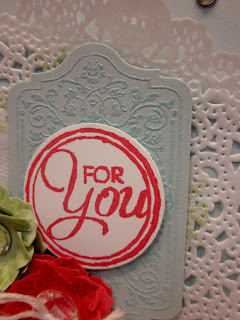 The Chalk Talk stamp was inked in versamark, then heat embossed with pool party embossing powder. 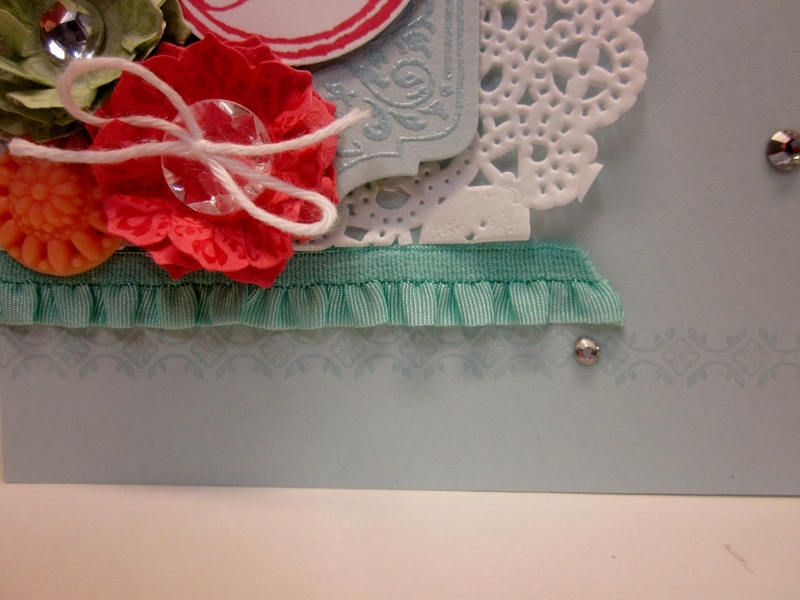 The card stock is soft sky, the pool party powder is a bit darker for a subtle look. 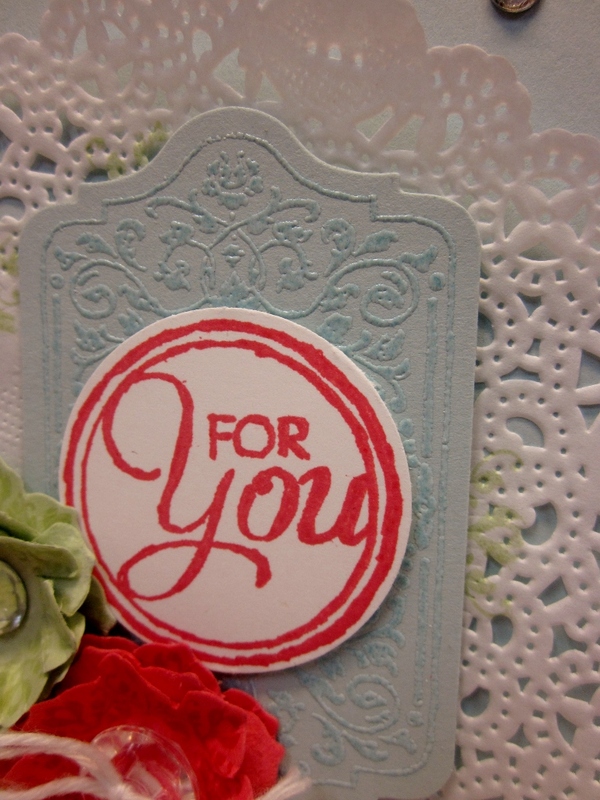 A tea lace paper doily provides my background. Can you believe no DSP was used on this card? I cannot! I stamped most of the details on, like this little modern mosaic border, topped with some sweet coastal cabana ruffle stretch trim. 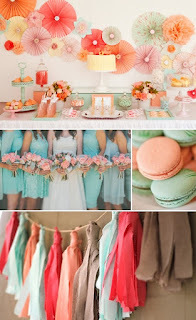 Other than the soft sky, the rest of the colors on this card are In colors; strawberry slush, pistachio pudding, crisp cantaloupe and coastal cabana. 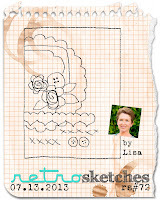 I used the current Retro Sketches sketch to start me out, these two challenges seem to be made for each other. Convention is among us and scheduled to start tomorrow. We have too many family commitments this summer for me to make it there, I will miss it, but will see plenty of pictures online. Also since we had been so super busy with family life in general, I was not able to enter the Artisan contest this year. I missed the excitement of not being a finalist, but since I could not go to convention it made it a bit better. Good luck to Jen Timko and Amy O'Neill, I am keeping my fingers crossed for you! This is as pretty as can be! 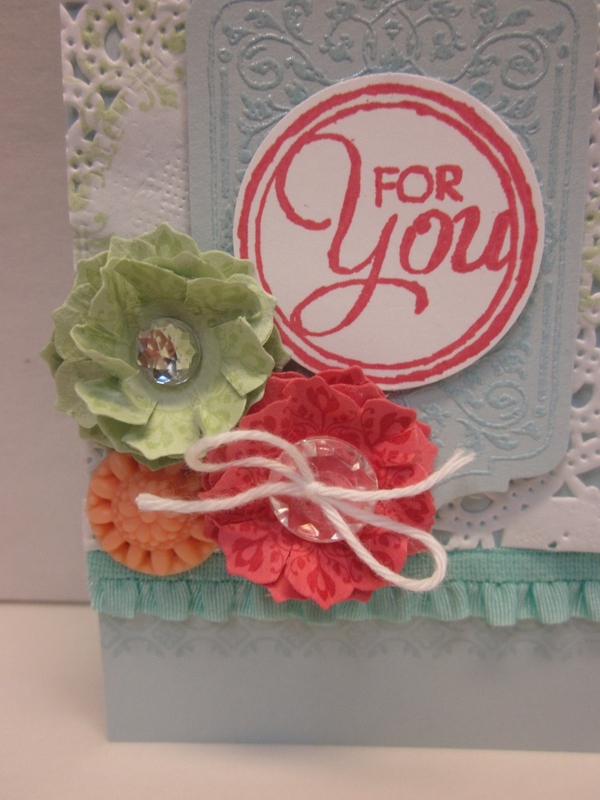 I like the little ruffle at the base of your doily! So happy you gave the sketch a try!! 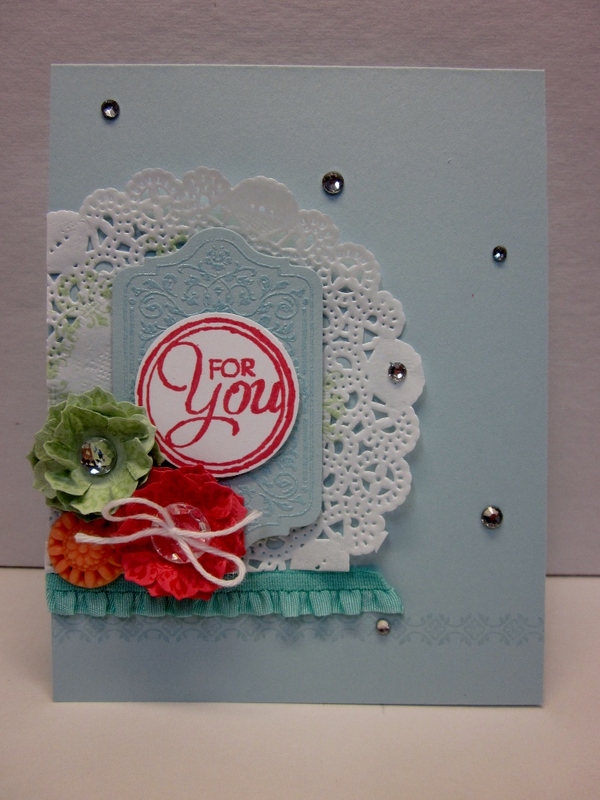 Lots of pretties on this card. Just the right compliments of size and textures. Great job!